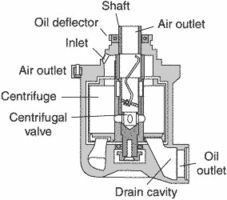 A deaerator oil-air mixture is churned by the centrifuge with air escaping from the top and oil being drained out from below. A container in which the air bubbles are separated from the returned oil before it is recirculated into the lubrication system of a gas turbine engine. Any air in the oil is allowed to escape while the oil is in the tray. It is a type of air-oil separator.